In this remarkable photograph above taken by Helmut Petschler (Photo generously loaned by Stewart Bailey), you can clearly see the newly built Rusholme Public Hall on the right of the frame. The photograph was almost certainly taken in the late 1860's, (Petschler died in 1870) and gives some idea that Rusholme even at then still had a slight rural feel. 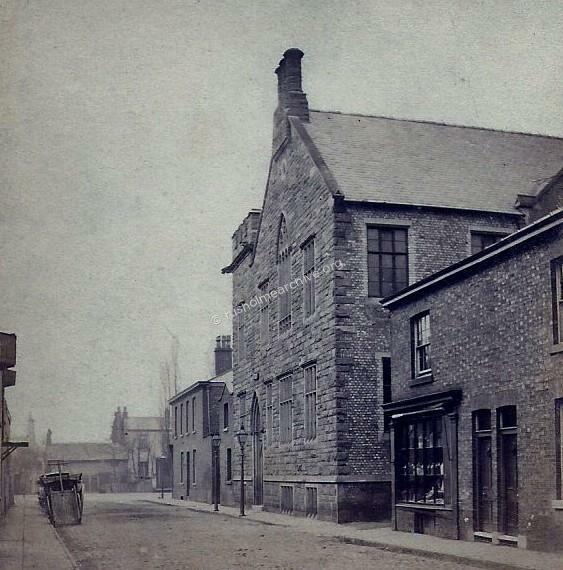 The cottage in the middle of the frame was on the westerly side of Wilmslow Road and demolished in the 1870's. The site of the hall was near the corner of Dickenson Road, nowadays the location would be opposite the car park of the Birch Villa Inn. The origins of Rusholme Public Hall seem to lie in the Victorian movement of self-help and personal education. In the Guardian, Jan 1st 1851 a report regarding the opening of the Rusholme Public Library and Reading Room referred to "several gentlemen in the village who had felt the neccessity for a reading room and library in the village. A room on Moor St was fitted up with seats and tables, well lighted with gas, and made in all respects comfortable and convenient. The room was supplied with two daily papers, the Times & Express, the Manchester papers, the Illustrated London News, the Gardeners Chronicle, Blackroods Magazine, the Athenauem and many of the weekly periodicals. The committee had examined and approved a list of some 300 volumes and there had been other presents of books". As the Township increased in size so the demand for the library & reading room outgrew the small reading room on Moor Street. On the evening of 26th April 1858 at the Birch Infants school, Dickenson Rd. a meeting of local residents, led by some notable local worthies, discussed the desirability of the erection of a Public Hall and Library that could accommodate the Moor Street library and reading-room, and provide more space for classes and lectures. Mr. E. R. Langworthy (the president of the library and reading-room) occupied the chair; and there were present the Rev G. Anson, , Dr Melland, Rev. A. Price. Professsor Greenwood, Messrs. W. Entwistle, T. Brittain, E. Reuss, R. Barbour, and others. The Chairman said it was not proposed to form a new institution, but to provide increased accommodation for a library and reading-room which had already been in existence for seven years, which had been both successful and self-supporting, but was inadequate for its members. In the building which was proposed to be erected, they contemplated having, besides a library and reading room, a large room which would also serve, when occasion required, for public meetings and concerts etc. The Rev. George Anson moved "that it was desirable to erect, by public subscription, a building to contain a library, reading, and class rooms, and a large common hall for the township''. He stated that during the seven years that the library and reading-room had been established in Moor Street the number of members had increased from 49 to 146. The average monthly circulation of books during the past year had been well over 100, and during April last year, the number of books circulated was 190. Mr. Entwisle seconded the motion, and spoke of the growing importance of Rusholme, and the desirability of the proposed building. Mr. Brittain, in supporting the motion said that institutions like this always succeeded when they originated with the working classes themselves as this had. The Rev. A. C. Price moved that the building to be erected be called the "Rusholme Public Hall and Library," and be vested in trustees to be chosen by the subscribers. Mr. Robert Barbour seconded the motion observing that public libraries appeared to be successful everywhere, and that a large hall for the purpose of lectures was most desirable. Professor Greenwood expressed the view that a series of classes, corresponding to those of the Working Man's College, would soon be established in Rusholme. A committee was then appointed to carry out the object of the above resolutions. 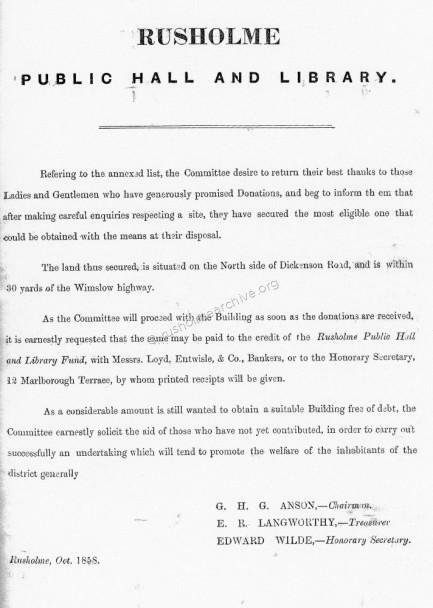 Later that year and certainly by October 1858 the committee must have requested residents to each commit a sum of money towards the cost of the new building. An initial list of subscribers volunteered varying sums of money and a document was drawn up to confirm their contributions. Quite remarkably one of these documents, (addressed to Mr J Mottershead) still survives in the Manchester Central Library Archives and it is copied below. I very much appreciate the help given by the library staff both in finding this and giving permission to publish it. Among the varying sums of money that was subscribed £132 came from the trustees of ‘Rusholme Green’. This does seem a little strange, Rusholme Green where it was illustrated on the 1818 map stretches virtually from Dickenson Rd back to Thurloe Street. As the proposed new entrance to Victoria Park cut through this land I wonder if the Rusholme Green was ‘enclosed’ for the benefit of the Victoria Park Company? On the 15th January 1859 a soiree was held at the Moor Street school at which the committee reported their progress about the proposed building of the new public hall and Library. Mr. W. Entwisle, (advantageously a well known Manchester Banker) was in the chair and present were the Rev. G. H. O. Anson, Messrs, T. Brittainr F. J. Gill, Alexander Smith, & others. The Committee stated that it had chosen a site for the new building in Dickenson Road which they had purchased for £275 where a reading-room, a library, and classrooms would be built together with a large room above, capable of holding over 700 persons. Not only did Sir Joseph Whitworth provide a generous £50 to the fund but he provided the stone from his quarry in Derbyshire. The design of Mr. W. W. Whitaker had been selected from several others and would be in the Gothic style, the cost was expected to be £2,000 of which approx £1,300 had already been raised including a donation of £140. being the balance of the old Rusholme Green Fund. Several gentlemen addressed the meeting and afterwards the Treasurer spoke & his report was adopted. 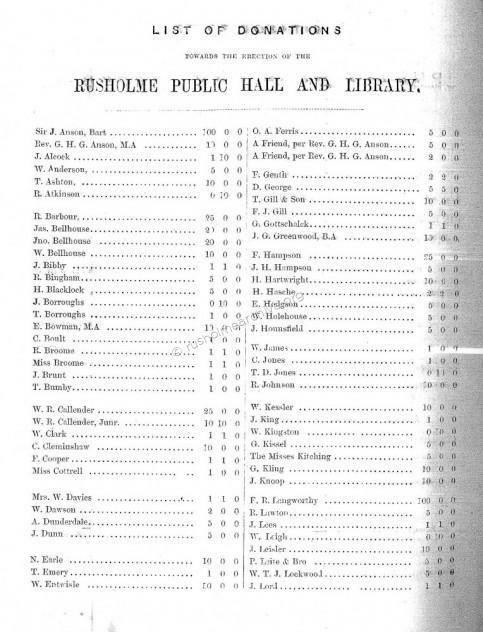 The Rusholme Public Hall and Library was finally opened on Saturday 14th January in 1860. William Entwisle, by now President of the Institute, was in the chair and present was Alderman Mackie, Mayor of Manchester, the Hon. Algernon Egerton, MP for South Lancashire, Professor Greenwood Principal of Owens College together with other eminent clergy and a number of notable local residents, particularly those from Victoria Park. The Chairman said that having lived in Rusholme for most of his life, (some 50 years), he had seen Rusholme as no more than a half dozen cottages and a public house grow to a Township of over 4000 inhabitants. He heartily congratulated the meeting and the inhabitants that by completing the building they had resolved themselves into a community with a common centre of thought and action, a place of intellectual culture for many and one where all could meet for the discussion of political and other matters. The Rev Anson said that the committee had aimed at avoiding any unnecessary expense but nevertheless providing a commodious, substantial and handsome building. The library already now had over 1000 books but the intention was to double this figure as soon as finance would allow. The total cost of building the Hall & Library including the land was £2,403.00. Donations had amounted to £1,300.00 so a further £1,000.00 had to be raised and it was anticipated that various functions would be held to raise the balance. That conversation or reading aloud shall not be permitted in the Reading Room, and that any Member offending against this bye-law shall be fined or otherwise dealt with as the Directors may decide. That members shall present their tickets on entering the rooms, or on obtaining books from the Library, if requested to do so by a Director or the Librarian. That if any Member transfers his ticket at any time to another person, such ticket shall be forfeited. That no Member shall detain any paper beyond ten minutes after an application for it by any other Member. That the books shall be delivered in the order of application, and that no work shall be renewed if applied for by another Member. That no Member shall lend a book out of his own house, under a fine of sixpence for each offence. That no Member shall be entitled to receive books from the Library until a printed form of security, which will be supplied by the Librarian, shall have been signed by a respectable person. That if any Member detain a book beyond the time allowed, he shall pay the fines to which such book is liable according to the notice pasted inside the same. That if a hook be damaged or lost by a Member, the Directors shall determine the amount of injury; and until such amount be paid, the Member shall be debarred the privileges of the Institution. That the Library shall be closed for a fortnight once in each year, that the books may be inspected by the Directors ; and that any books not returned at such time as may be appointed by the Directors, shall be charged one penny per day beyond the prescribed time.	.
That any Member violating any of' those bye-laws which impose no particular fine or penalty, shall be subject to such penalty; as the Directors may deem proper. It is requested that the leaves of the books may not be turned down, that no person deface them by writing or marking in them, and that care be taken to keep them clean. In all cases of application for books, it is requested, that the number be written upon a slip of paper, and handed to the Librarian. To facilitate delivery, it is desirable that the numbers of more than one be put down, in case the first-named be already in circulation. Members are at liberty to examine the books on the shelves, but are requested to return them to their proper places, and on no account to take any away without the knowledge of the Librarian. 1864; A memorable year ? In January 1864 the Annual Report was presented by the Hon Secretary Mr Mayson. Although there were 200 subscribing members the committee had expressed disappointment that the number was not higher. However there was a day school running and was proving to be prosperous with an increasing number of pupils. Evening classes had started and there had been some lectures and discussion groups becoming active. Over 5000 books had been loaned during the previous year and more were to be purchased. A savings bank had started on one night of the week and deposits averaged one shilling, although some contributions were as low as one penny! A decision to provide facilities for the physical improvement of the members was implemented and an 'American Bowling Alley' had been laid and was proving very popular. The Treasurer reported a carefully managed budget, £322 income and £321 expenditure, however the Building Account was still in deficit to the sum of £500. A Bazaar in May was planned and they hoped the profit would clear the debt. The Chairman closed the proceedings by expressing the view that the Hall was proving successful in most directions and hoping that by the end of the year all debts would be cleared. The Bazaar proved to be quite successful, it raised £600. Presumably the building account debt of £500 referred to at AGM earlier in the year was cleared, the next AGM it was recorded that the building was free of debt. 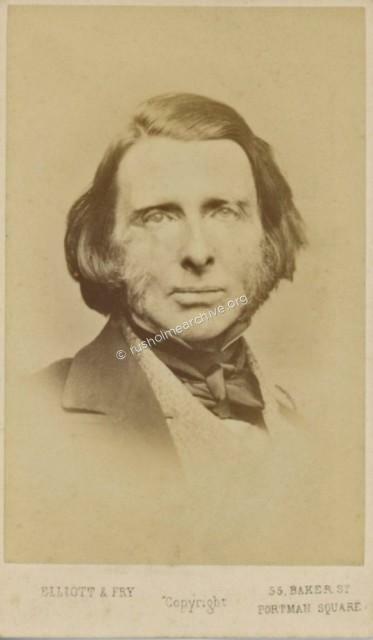 John Ruskin, (photograph above), was considered to be, perhaps, the leading English art critic of the Victorian era, author, painter, a prominent social thinker and philanthropist. 'the rare intellectual opportunity just enjoyed'. This lecture was given December 6, 1864, in a crowded Rusholme Public Hall, in aid of a fund for the Rusholme Institute and Birch School Library. 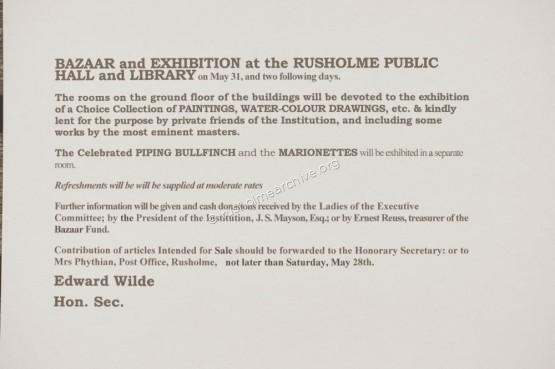 Although the building of Rusholme Hall and Library had the education of the working class in mind this particular event must have been for the more prosperous classes in Rusholme. Admission was charged at 4/- for 'registered' seats, 2/6d for the mid-seats and 1/- for the back seats. 'That he always came to Manchester some- what nervously, feeling that he came to address an audience in the most powerful city on earth in its probable future and influence on the destiny of mankind. A few days later Ruskin delivered another speech in Manchester Town Hall and the two speeches were the basis of a subsequent book. 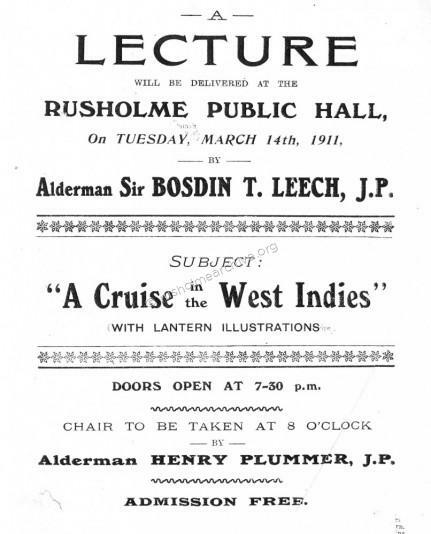 This lecture in Rusholme Public Hall must be considered one of the most significant events in its history. 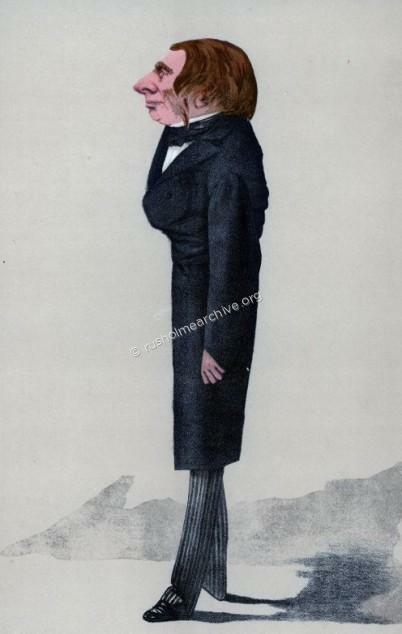 John Ruskin was without doubt a somewhat controversial figure, in the 'Spy' cartoon below taken from the Vanity Fair magazine there was a very critical appraisal of Ruskin. Perhaps it is not surprising that the lecture was described as being crowded! There is, perhaps, no harder fate in store for a man than to be irredeemably at variance with the spirit of the country and the times in which he lives; and it is Mr. Ruskin's great misfortune to be an incurable poet and artist in a materialistic and money-grubbing generation. He is so entirety out of harmony with all of modern life that surrounds him that he is by many regarded as an anachronism rather than as a man, and that his views are looked upon rather as vain protests than as serious opinions. It is, however, his greatest merit that he is utterly careless of the current habits of thought, and that he has thus been enabled fearlessly to supply to them precisely those elements in which they are most wanting. The English people have become meanly practical, and he is grandly unpractical; they have become essentially commonplace, and he is gloriously poetical; they believe in nothing more than cash, he believes in nothing less; they are thoroughly positive, he is thoroughly ideal. It has been reserved for him, in spite of all such disadvantages, to produce works which from the mere power of then: language have captivated even the most indifferent, and which have set many thinking in quite a new direction. First known as a writer on art, he soon showed himself a very Turner in the use of English prose, which in his hands takes a richness of drawing and a splendour of colouring never before attained. And he has therewith disclosed a minute acquaintance with all that is beautiful in nature, only to have been acquired by a loving study guided by the most perfect sympathy. His "Modern Painters" first brought us thoroughly acquainted with the rare qualities of English art, and his " Stones of Venice" was a striking illustration of the result obtained by applying his cast of thought to architecture. 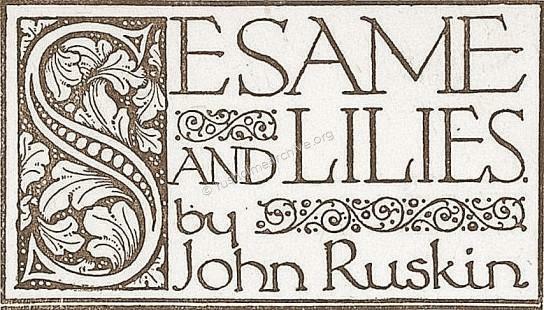 It is, however, as an observer of politics—for he is no politician—that Mr. Ruskin is perhaps the most remarkably in antagonism with the current Englishman, He sees in the universal desire to make money exclude every other object of exertion the great and fatal evil of the times, and rebels entirely against all the complex social and political arrangements which have been constituted into a system to that end. He holds that to rely on manufactures for greatness is to lean upon a broken reed, and that England must live upon herself through agriculture if ever she would return to a healthy condition of existence. So convinced is he of this that he has given a tenth part of his fortune to found a colony in which Englishmen shall be developed, through the alternation of agricultural labour with artistic pursuits, into the better specimens of humanity which he believes can thus alone be produced. That he will ever see his opinions adopted or even seriously entertained is not to be expected; but by those who have not bowed the knee to the modern Baal he will be gratefully remembered as one preaching in the wilderness the abandonment of the grosser things of life and the realisation of the Ideal. In the report from 1864 reference was made to the physical well-being of the members. One curious piece of evidence regarding 'exercise' still survives in the form of a carte-de-visite pictured below dated 1870. One of the groups that met here was the Rusholme Gymnastics Club and William Royle was the Secretary. He refers to the club as being of particular value in the community and another local benefactor and public figure, Alderman Goldschmidt was the President. 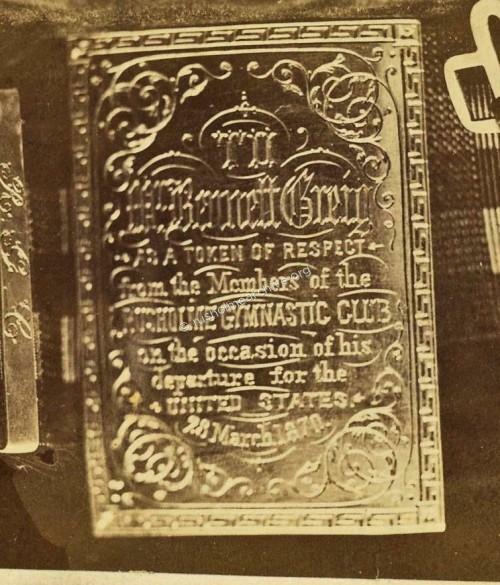 The photograph is of a silver buckle on a belt that was presented to Bennet Greig by his colleagues at the Rusholme Gymnastic Club, a gift on the occasion of his departure to America on 28th March 1870. 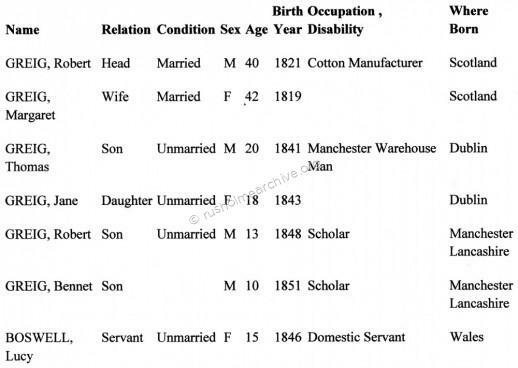 The Greig family lived nearby and details from the 1861 census, (below), show the family included Bennett, the youngest son. In October of 1864 a very brief notice in the local press referred to a concert at the hall. A very simple message announced that Miss Whitham would sing at the Rusholme Public Hall, the concert would commence at 7.30pm prompt. There was no mention of ticket charges, who promoted the event or what she would sing. Miss Whitham featured regularly in various Manchester concerts including those presented by Charles Halle and apparently had a fine 'strong' voice. She was in fact from Yorkshire and one of the leading members of the Huddersfield Choral Society. When the Hall was opened in 1860 one of the remarks by the chairman referred to the hall being used for political discussion. There certainly seems to have been plenty of meetings held in the Hall both for Municipal and Parliamentary elections. Even the elections that were held for the Rusholme Board of Health attracted more candidates than vacancies. Until 1885 Rusholme was part of the South Lancashire Parliamentary Constituency and then it became part of the Stretford Constituency until 1918. Rusholme was a parliamentary constituency from 1918 until 1950. It consisted of three wards, Rusholme, Longsight & Levenshulme. Between 1950 & 1955 the Rusholme ward became part of the Withington constituency, but in 1955 it became part of the Ardwick Parliamentary Constituency. 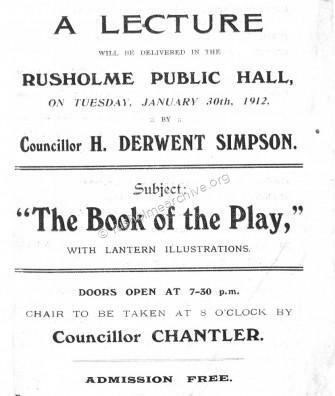 Meetings in the Rusholme Public Hall certainly attracted large crowds. Before the media dominated political issues meetings held by candidates were popular. The Suffragettes held meetings in Rusholme to explain their position. Other meetings had candidates arguing against votes for women. On one occasion at a meeting for a municipal election in 1902 nearly every clergyman in Rusholme joined the platform to support one particular candidate for re-election. 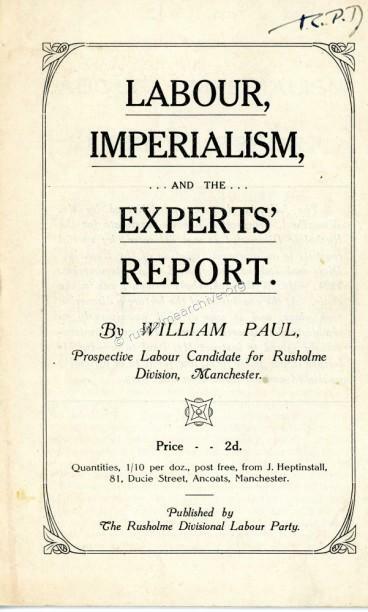 There was a particular controversy in the 1920's when the Rusholme Labour Party selected William Paul, a Communist, to fight two consecutive parliamentary elections for the Rusholme seat. A number of letters and articles in the National press about this candidature brought Rusholme into the limelight. Meetings at the Hall had both the Conservative and Liberal candidates raging at Rusholme Labour Party. At one meeting called by the Liberal candidate, between 100 and 150 Labour supporters turned up to heckle the speaker, the sitting MP, Charles Masterman, eventually the Chairman, Sir William Milligan, had to close the meeting, but this was not until gone ten o'clock and still people protested that there was not enough time to question Masterman. The Rusholme Labour Party also challenged the Town Hall ban on Sunday evening meetings. In 1920 the Secretary of Rusholme Labour party was agitating for the Rusholme Public hall to be made available for party meetings on a Sunday. But a very firm letter from the Town Clerk said the Town Hall committee only allowed meetings on a Sunday in Public Halls if they were of a religious nature and complied with the Sunday Observance Act! The Manchester branch of the North of England Society for Women's Suffrage held a meeting in November 1909 at the Rusholme Public Hall. Mrs. Swanwick who presided, made clear in her opening speech that as women have no influence over the House of Commons they are as helpless as the one in a home who has no control over the purse-strings! Miss Helena Randell, the Younger Suffragists organiser spoke and emphasised the need for contining the work with 'unabated vigour'. 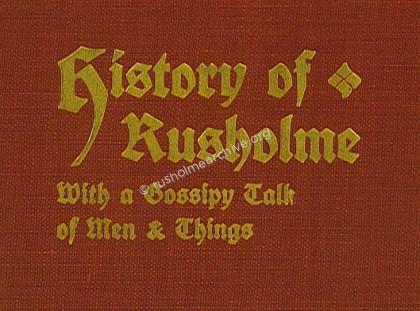 William Royle in 1904 gave lectures about the history of Rusholme which was the basis of his book, 'History of Rusholme,With a Gossipy Talk of Men & Things'. I can find no reference as to the success of the lectures but quite a number of the books have survived for over a century, as it was first published in 1906, two years after his lectures. In the early 1920's free lectures were organised by the Manchester Agricultural Committee. Here are two examples of the lecture titles; October 26th 1923; 'POULTRY: How to obtain the winter egg' by Mr W Hamnett of Blackpool, and on Thursday 16th October 1924 'SMALL HOLDING WORK' by Mr W Pettigrew, Manchester Parks Superintendent. Two further handbills that I found in the Manchester Library archives refer to lectures in the Hall with 'Lantern Illustrations'. Again I should like to thank the Manchester Library Archives for permission to reproduce the two items below. One use that the hall was put to and that was never anticipated in the 1860 opening speech occurred during the first world war. The Manchester City Council who had been managing the Hall since 1891, (information about this later in the page), were aware that some members of the armed forces could not maintain a home whilst 'fighting for their country'. Accordingly the Council made provision in a number of public halls to store the furniture for the duration the war. The City Council decided that no charge should be made for such storage, and that the furniture should be insured by the Corporation against risk from fire and aircraft, but that except in cases of financial hardship the cost of removal to and from the stores should be borne by the servicemen. Altogether over 130 households took advantage of the scheme but the one problem that continued after the war ended was the owners of the furniture had difficulty finding homes to put their furniture in! 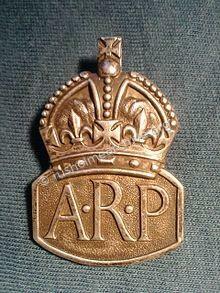 During the second World War the Basement of the Hall was used as ARP base, (Manchester No. 6). 'During the Second World War, the ARP, (Air Raid Precautions), was responsible for the issuing of gas masks, pre-fabricated air-raid shelters (such as Anderson shelters, as well as Morrison shelters), the upkeep of local public shelters, and the maintenance of the blackout. The ARP also helped rescue people after air raids and other attacks, and some women became ARP Ambulance Attendants whose job was to help administer first aid to casualties, search for survivors, and in many grim instances, help recover bodies, sometimes those of their own colleagues'. In the Rusholme Public Hall the basement was strengthened with steel joists, a telephone system installed so that Police, Fire Brigade and Ambulance could be contacted if there was any bombs dropped in the surrounding area. As in the two preceding paragraphs the following use of the Hall was most unlikely to have been anticipated. Perhaps as a consequence of the epidemic of syphilis that occurred during the Ist World War the Manchester Public Health Office decided in 1925 to mount a campaign to draw attention the gravity and incidence of venereal disease that was still prevalent. A series of films were made, (with the approval of the Ministry of Health & Watch Committee), with the intention of screening the films in all of the Public Halls. The title of the films included; 'Damaged Goods', 'The End of the Road', 'How Life begins', 'The Shadow' & 'The Flaw'. When the film 'How Life Begins' was shown in Rusholme it was for women only and 'lady doctor' was present to explain about free treatment in the clinics. This did seem a quite enlightened policy for the period, particularly as girls over 15 and boys over 17 were to be invited to see the free films. 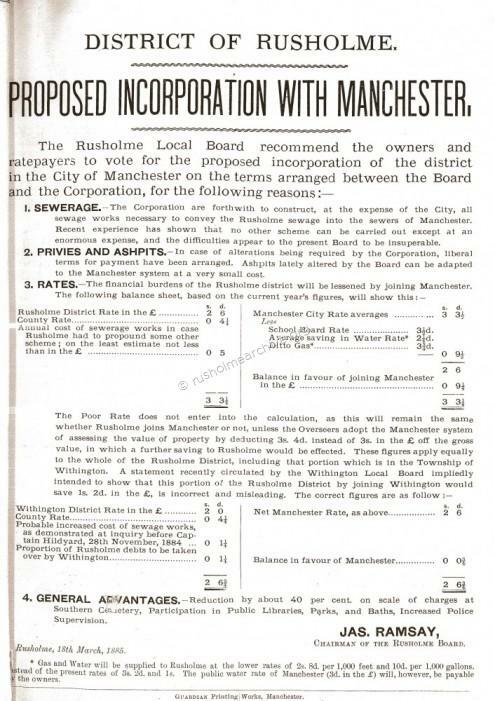 Incorporation of Rusholme into Manchester. The Rusholme Board of Health was the 'local authority' that managed Rusholme. It was struggling with a massive problem of trying effectively to manage a sewage system that was quite inadequate for the fast growing Rusholme population. 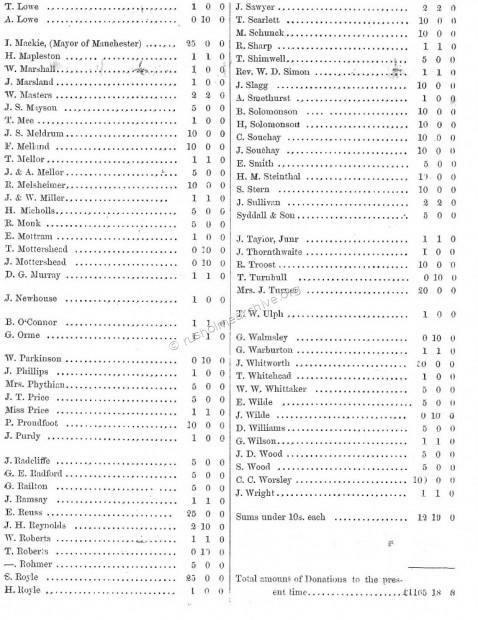 In 1885 there was a poll of ratepayers to see if there would be majority in favour of incorporation with Manchester. Below is another 'find' in the Manchester Archives and again I appreciate permission to publish this 1885 handbill. The last days of the Institute. In the document above the fourth item, General Advantages, refers to Participation in Public Libraries. Of course this meant free libraries. It should not be forgotten that at this time, according to William Royle, the Rusholme Library facilities cost 2/6p a quarter (12.5p in decimal currency). Within a few months there was agitation for a 'free library' in Rusholme. A letter in January 1886 to the Manchester Guardian expressed the view that as the nearest free libraries were at Hulme or Ardwick then Manchester City Council should provide a library and reading room in Rusholme. All classes of resident could use the facilities with the cost being equally shared by the ratepayers. The letter also suggested the trustees of the Rusholme Public Hall & Library could hand over the Hall to the City Council. The letter appears to have fallen on deaf ears and it was some five years later in 1891 that financial pressures on the trustees caused them to consider the matter. In July 1891 the trustees called a meeting of the members and the chairman opened the meeting. He said that for several years the financial prospects of the institution had caused considerable anxiety to the trustees who were obviously responsible for its maintenance. He reminded members that the the Hall & Library was founded in 1859, and the aim of the founders was to provide for the residents of Rusholme opportunities for educational and social enjoyment such as had until then not been within their reach. However there has been a gradual reduction over the years in the average monthly attendance, the 'number of new members' admitted, and the subscription list. The directors recognised that this was probably due to the attractions of newer and better equipped institutions. A boys' day school, carried on for over 20 years under the same master, understandably suffered competition from the new free Board Schools. 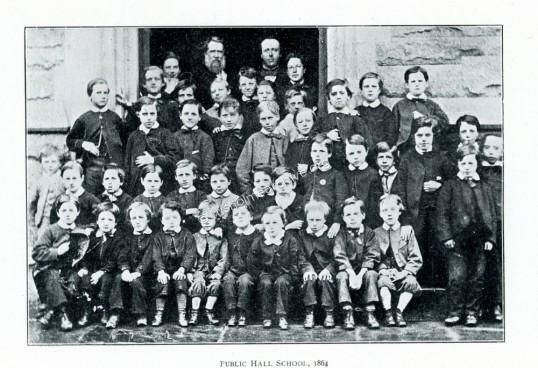 The Board schools came into existence in 1870 and were now responsible for educating many of the Rusholme children. Before the incorporation of Rusholme in 1885 with Manchester the Local Board had its offices in the Public Hall, and the rent paid helped to keep the institution going. A billiard table was provided for the use of members, and although the charge was modest, other attractions elsewhere proved too strong and socially it has had to give way to the various clubs which have sprung up in the City and surrounding district. A savings bank established in connection with the Manchester and Salford Penny Savings Bank Association was very successful, but did not provide much revenue. 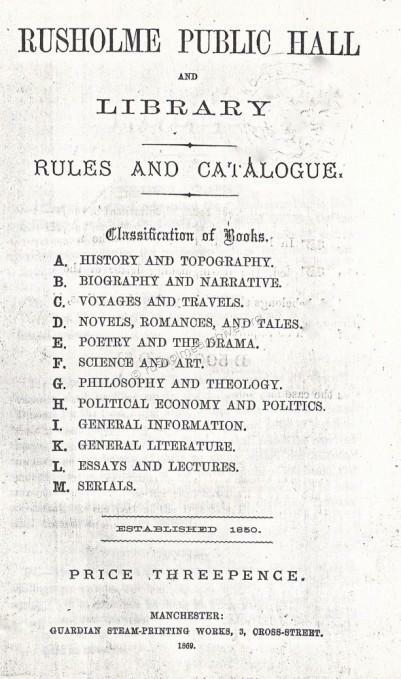 'That the Rusholme Public Hall and Library Institution should be dissolved on the 29th day of September, 1891,and that the property should be given to the Corporation of Manchester for the purpose of the establishment of a free library and reading-room for the general use of the public'. William Royle seconded the motion and acknowledged the number of members had fallen in recent years from 500 or 600 to about 150. He and the trustees felt that the Public Hall, with a library of 5,000 volumes, should be of more general use and it would be a generous gift they were proposing to make to the Corporation. The building had cost £3,000, and would be handed over free of debt. Alterations and improvements were made to the Library in 1914; the following notice was published in the Manchester Courier on the 8th July 1914. "The Rusholme Public Library will be opened to-day at 8.30 a.m. after extensive alterations. Originally established in 1860 as a subscription library, it was handed over to the Manchester Corporation in 1891. The number of users increased rapidly after the Corporation took over the management, and the library became and has continued one of the busiest of the branches, with an issue for home reading often exceeding 600 volumes daily. During the alterations, the interior of the old library has been entirely reconstructed, division walls have been taken away, the reading room has been doubled in size, and now has accommodation for about 150 readers. The electric lighting has been rearranged, and the lending department has been transferred to an extension at the back of the building. The library, which contains about 15,000 volumes, has been arranged on the open access plan, by which readers are enabled to select their own books from the shelves. The general effect of the alterations has been, to rejuvenate the library and to give Rusholme a bright, up-to-date building in place of the dark, ill-adapted one which has served it so long". The bazaar was held on October 21st 1926 and was promoted by the clergy and congregation of St. James's Church, Birch-in-Rusholme to raise £2,000 for church and school purposes. It was opened in the Rusholme Public Hall, Manchester, by Miss Sybil Thorndike. ''St. 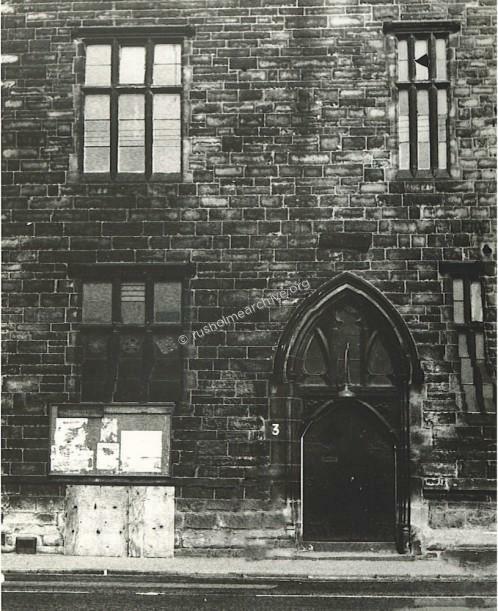 James's parish was situated in a district inhabited not by people who were too rich and who were looking forward to leaving Manchester to live in country mansions, but by people with the capacity and the desire to contribute to the welfare of the city'. Miss Sybil Thorndike, who was cordially received, said that coming to Manchester was to her like coming home. Wherever there was a Manchester soul, she knew there was warmth and affection. 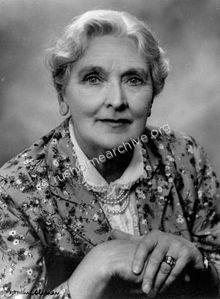 Dame Agnes Sybil Thorndike CH DBE (24 October 1882 – 9 June 1976) was a British actress. She had first come to work in Manchester in the Gaiety Theatre in 1908-09 and later in 1911-13. She was married to Sir Lewis Thomas Casson MC (26 October 1875–16 May 1969) who was a British actor and theatre director. Certainly Both Sybil and Lewis were active members of the Labour Party, and held strong left-wing views. Even when the 1926 General Strike stopped their production of the first run of Saint Joan, they both still supported the strikers. Nonetheless, she was made a Dame Commander of the Order of the British Empire in 1931. As a pacifist, Sybil was a member of the Peace Pledge Union and gave readings for its benefit. In 1970. she was made a Companion of Honour. Dr Hewlett Johnson was born in Manchester, the third son of Charles Johnson, a wire manufacturer, and his wife Rosa, daughter of the Reverend Alfred Hewlett, he graduated from Owens College, Manchester in 1894 with the geological prize but later attended Wadham College, Oxford and was ordained in 1904. An avowed Christian Marxist, Johnson was brought under surveillance by MI5 as early as 1917, when he spoke in Manchester in support of the October Revolution. His political views were unpopular but his hard work and pastoral skills led to him being appointed Dean of Manchester by Ramsay MacDonald in 1924. He was appointed Dean of Canterbury in 1931. He shot to public prominence in the 1930s when he contrasted the economic development of the USSR under the First Five Year Plan to Britain during the Great Depression. He toured the Soviet Union in 1934 and again in 1937, reporting on each occasion the health and wealth of the average Soviet citizen and that the Soviet system protected the citizens' liberties. Perhaps the last 'political' event at the Hall took place in July 1969. Rusholme was by now in the Ardwick constituency and the Labour Party selected Gerald Kaufman, the Press Secretary to Harold Wilson, the Prime Minister, to be their candidate at the next Parliamentary election. Gerald Kaufman was elected the MP in 1970. The Hall continued as a Library and public meeting place until 1970 when the Library closed. The Hall then became vandalised and sadly in the face of much local opposition & despite a vigorous campaign by Rusholme residents, Manchester City Council demolished Rusholme Public Hall. The City Council most notably failed to provide a replacement Library, let alone a community hall in Rusholme. This must have been one of the most appalling civic acts of vandalism undertaken by the Manchester City Council and is a very sad memorial to the public spirited citizens of Rusholme who in the middle of the 19th century worked so hard to create the Rusholme Public Hall and Library as a centre of learning and recreation.